What is a Silver Exchange-Traded Fund (ETF)? Investopedia defines it well: "An exchange-traded fund that invests primarily in raw silver assets, which are held in trust by the fund manager and/or custodian. 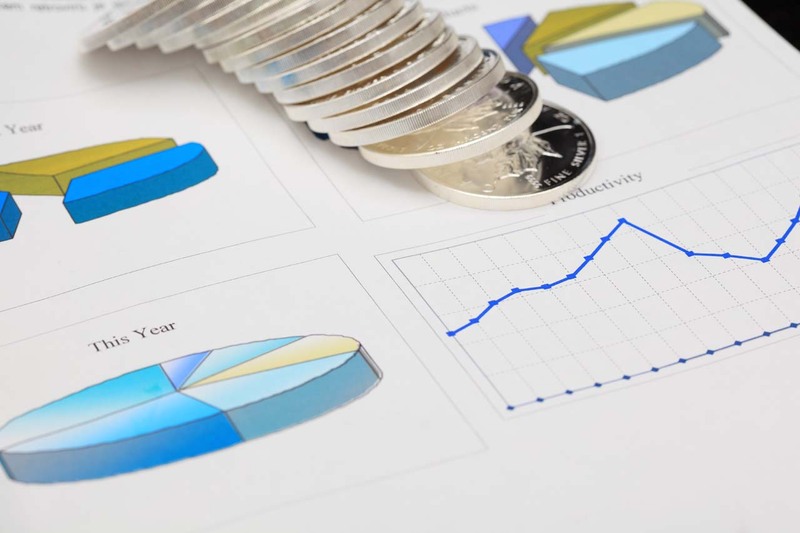 Typically, silver ETFs are established as grantor trusts, where each share of the ETF represents the specific right to a precise amount of silver, measured in ounces. Silver ETFs aim to track as closely as possible the spot price of silver on the open market. The first to market was the iShares Silver Trust (SLV), managed by Barclays Global Investors and introduced in 2006." At this point in time (June 26, 2009) SLV has 280,510,676.900 ounces of silver in trust and is selling at a -1% discount. SLV has a current value of approximately $3.998 billion. Here's a listing of other silver ETFs. It's important to note what an ETF like SLV is and what it isn't. SLV is not silver but rather a security that trades on the AMEX. The ETF is backed by trust assets consisting of silver held by the custodian on behalf of the trust. It is simple and cost-effective to invest in the ETF to gain exposure to price movements in silver, but as stated above, the ETF is not an investment in silver itself. For example, should the need arise, an investor would not be able to exchange ETF shares for bullion other than through an Authorized Participant, and then only in baskets of 50,000 shares. Why Should an Individual Look at Owning a Silver ETF? I don't think an individual should consider SLV, as there are much better silver investments than SLV for individual investors. Are there advantages/disadvantages to owning a silver ETFs versus owning physical? Nothing, I mean nothing, beats owning the real thing. The only "advantage" to owning the ETF is that many funds, money managers, and institutions are prohibited from owning commodities so the ETF is traded like a stock and therefore allows these types of entities to own silver. That was the primary purpose in developing these ETFs, in my view. John Rabio and James Turk have stated, and I agree, that the "daisy chain" involved in SLV makes it complex and convoluted because, as stated above, the SLV investor owns the iShares (not silver—silver can never be redeemed). The shares are issued by the Trust (Bank of New York), which hires a Custodian, which can have any number of Sub-Custodians, Agents or Depositories, where the silver is purportedly held. Compare this "daisy chain" with the true silver owner, who owns and controls his own silver. What are Your Criteria in Choosing an ETF? I think they can serve a purpose for brokers, and large institutional clientele but I have no strict criteria. The structure of the gold and silver ETFs are pretty clear that the underlying asset is not strictly accounted for using the most basic understanding of "ownership." Are There Tax Issues an Investor Should be Aware of in Owning ETFs? Yes, in the U.S. the GLD and SLV are taxed at the highest tax rate regardless of how long you own the investment. This does not apply to mining equities that are held for more than one year. Long-term gains in the silver ETFs are taxed as collectibles at 28%. In comparison, Central Fund of Canada (CEF), which is located outside the U.S., is considered a passive foreign investment company with shares not convertible into bullion. CEF qualifies as a PFIC to enable the 15% capital gains tax treatment, which can be an important factor for investors. What Should Investors be Aware of When Buying ETFs? Know what you are doing, explore all other alternatives, and choose wisely. The reassertion of counter-party risk is driving much of the risk in the current markets. SLV doesn't allow independent audits, can lease your silver out, and does not segregate or allocate your silver. Mr. Morgan has been published in The Herald Tribune, Futures magazine, The Gold Newsletter, Resource Consultants, Resource World, Investment Rarities, The Idaho Observer, Barron's, and The Wall Street Journal. Mr. Morgan does weekly Money, Metals and Mining Review for Kitco. He is hosted monthly on Financial Sense with Jim Puplava. Mr. Morgan was published in the Global Investor regarding Ten Rules of Silver Investing, which you can receive for free. His book Get the Skinny on Silver Investing is available on Amazon. You can subscribe to his private Internet-only newsletter, The Morgan Report, by clicking here. Mr. Morgan has been published in The Herald Tribune, Futures magazine, The Gold Newsletter, Resource Consultants, Resource World, Investment Rarities, The Idaho Observer, Barron's, and The Wall Street Journal. Mr. Morgan does weekly Money, Metals and Mining Review for Kitco. He is hosted monthly on Financial Sense with Jim Puplava. Mr. Morgan was published in the Global Investor regarding Ten Rules of Silver Investing, which you can receive for free. His book Get the Skinny on Silver Investing is available on Amazon. His private Internet-only newsletter, The Morgan Report, is $129.99 annually. Chapter 3: Physical Silver – To Buy or Not?